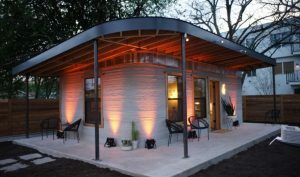 The production version of the printer will have the ability to print a single story, 600-800 square foot home in under 24 hours for less than $4,000. As a part of this effort, ICON has developed cutting-edge materials tested to the most recognized standards of safety, comfort and resiliency and is designed to function with nearly zero waste production methods and work under unpredictable constraints (limited water, power, and labor infrastructure) to tackle housing shortages. I suppose there’s no intrinsic reason one couldn’t build a bigger (though still single-story) house as repeated modules. Big or small, though, printing a house, wow. Three-D printing is definitely science-fictiony and getting more so all the time. Previous PostWe live in an SF world	Next PostCan slick marketing sell bad books?